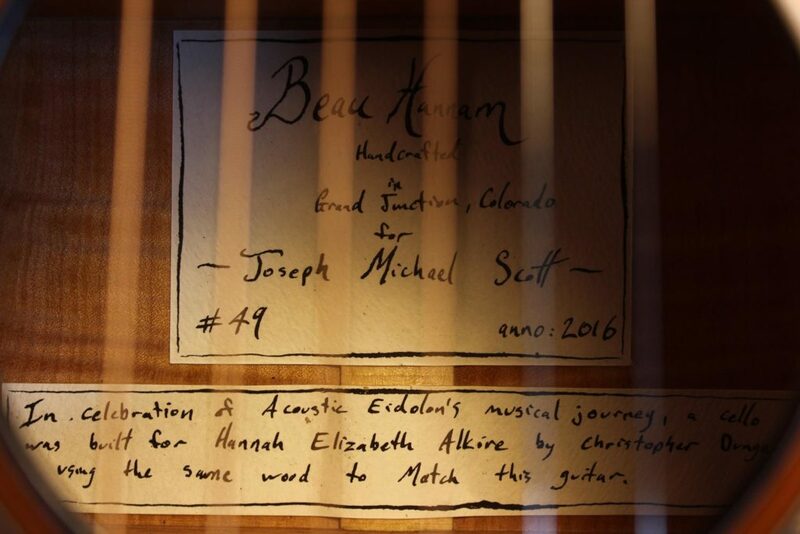 Beau Hannam: A guitar and uke with “The Tree” quilted mahogany and master grade European Moon spruce with art deco inlays throughout. 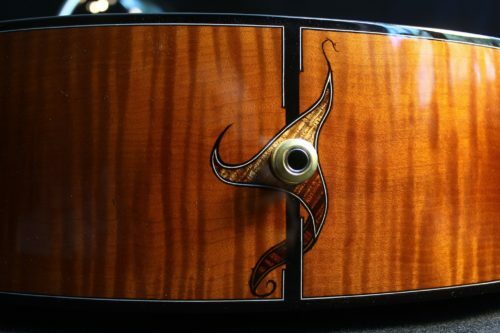 The neck will this beautiful bear claw-like figured “plum pudding” mahogany from Guatemala. 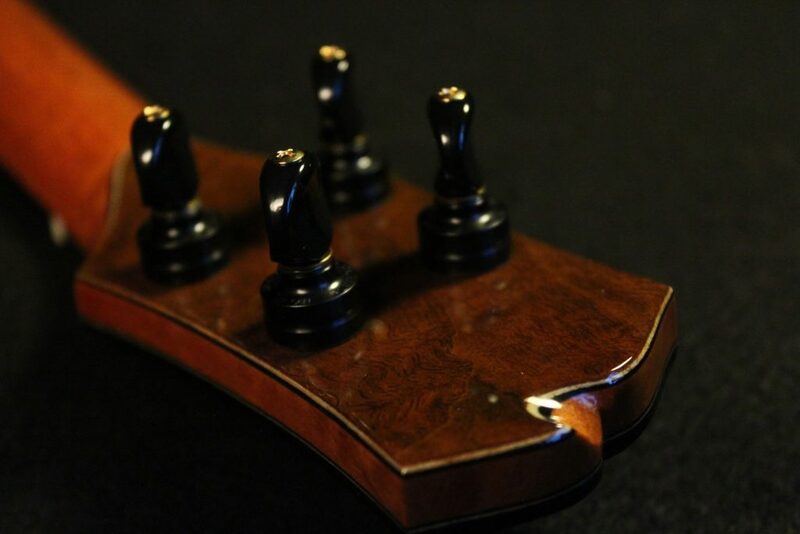 I just finished three ukes, in figured Brazilian rosewood, Tasmanian blackwood and Koa with redwood and cedar tops. The instrument before that was a cello/guitar collaboration with Christopher Dungey who makes extremely expensive cellos for some of the world’s best concert musicians. 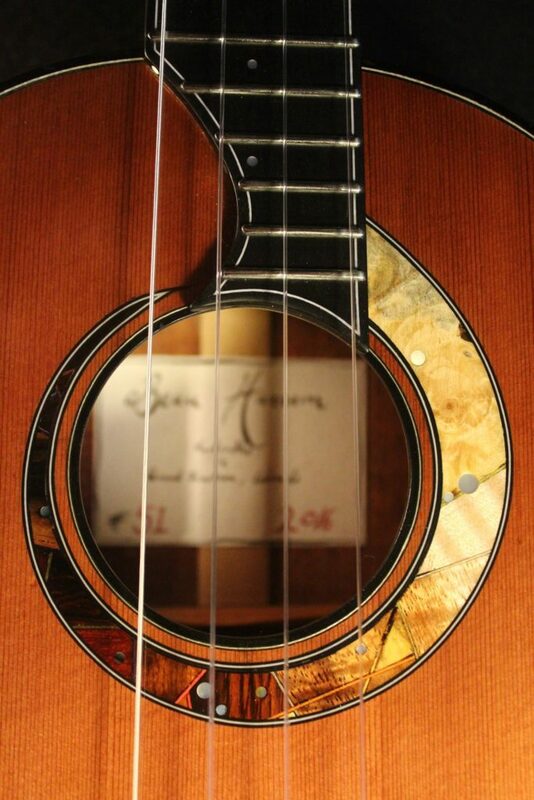 Chris felled his own Engelmann spruce in 1982 and quilted maple in ’92, so we used consecutive slices of wood from the same billets for both instruments. BH: Due to a severe case of getting married to a redheaded Texan gal, I moved from Sydney, Australia to Grand Junction, Colorado in 2013. I then realized that winter is actually cold in the U.S.! I remember trying to use my Lie-Nielsen brass block plane on a freezing morning and I just couldn’t hold it for longer than 10 seconds, so I moved into a room downstairs in the house where I have been working for three years. I’m only just now finding the time to insulate the double garage where I will be creating a much nicer environment to work out of. Working with Chris Dungey in his beautiful cello shop inspired me to not work in a dusty cave, but to develop a very nice place to work, a place that is a pleasure to walk into and spend the day crafting. BH: I began playing fingerstyle guitar when I was about 10. I was playing 1960s English folk like Bert Jansch and John Renbourn (who remain my favorite guitarists). I started my lutherie education when I found Cumpiano’s book in a second hand book sale, around 2001, while I was studying Philosophy & Theology. I read it cover to cover, taking it in, learning the language and techniques. I then starting at the Gilet Guitars school of guitarmaking in Botany, Sydney (where all the convicts landed!). Gerard Gilet is an excellent and very thorough teacher. From the first to last day (usually about 25 days), each student is immersed in a master class of how to select woods, construction, finishing and setup. A lot of time is taken with each student to talk through ideas, how to solve problems and also to view the profession in a realistic and practical way. 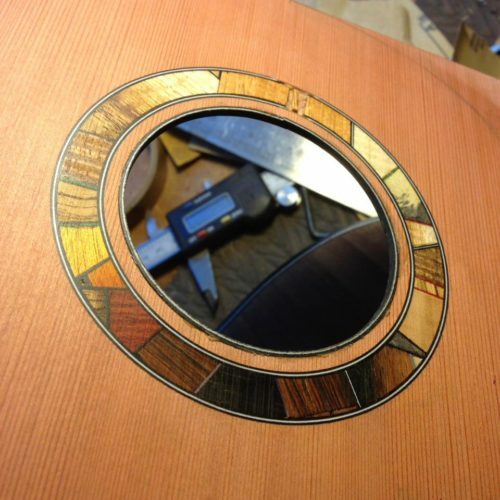 This is accumulated in his book, co-authored with Trevor Gore, Contemporary Acoustic Guitar Design and Build. 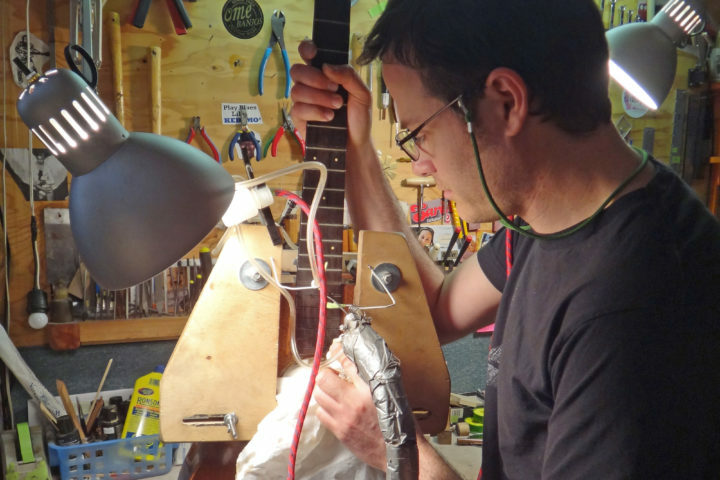 After building three guitars, Gerard started to give me repair jobs and help teach new students, so I transformed from student to employee. In short, I knew this was what I wanted to do, so I made sure I was good at it. I was at Gilet Guitars until 2013-ish. While there, I didn’t feel any desire to sell my own instruments out of respect to Gerard. It wasn’t until I moved to Colorado that I promoted myself as a luthier available for orders. So while moving country, I got a website together and developed a strong Facebook presence and after three years I now have a three-plus year wait list and new workshop and no debt, all of which I’m very proud of. Now I just have to keep getting better over the next 40 years! FJ: Do you have a particular philosophy about wood/materials? BH: During my time at Gilet guitars we built about five excellent-sounding guitars made from Tasmanian Tiger myrtle, which is an incredibly beautiful-looking wood, matched only by its incredibly bad tap tone. It sounds like wet cardboard when tapped–definitely the worst taptone “Q” I’ve ever heard in back/sides tonewood. However, it consistently made these great sounding guitars. So that education changed my perception of back/side wood, its role as a sound producer (or tonal colorer), and how much it gave of itself in that role. 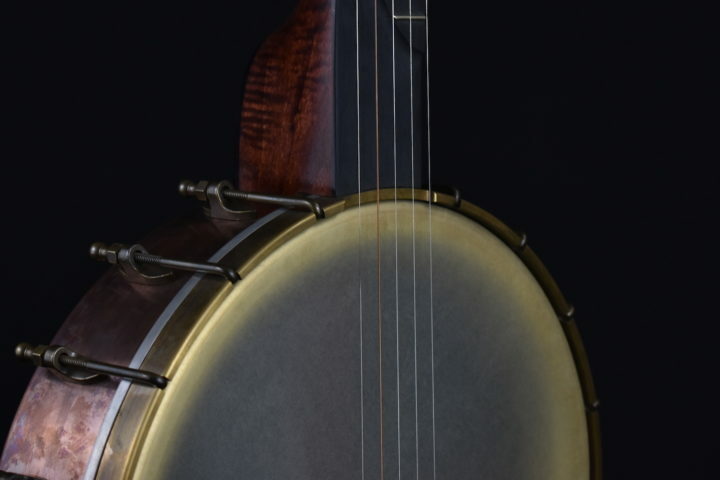 The inevitable conclusion drawn from empirical evidence was that the sum of the role the back and sides were traditionally thought to have added to the sound of the instrument was much smaller compared to the top (and by “top” I mean everything about it, species, thickness, bracing, bridge weight and design et cetera). 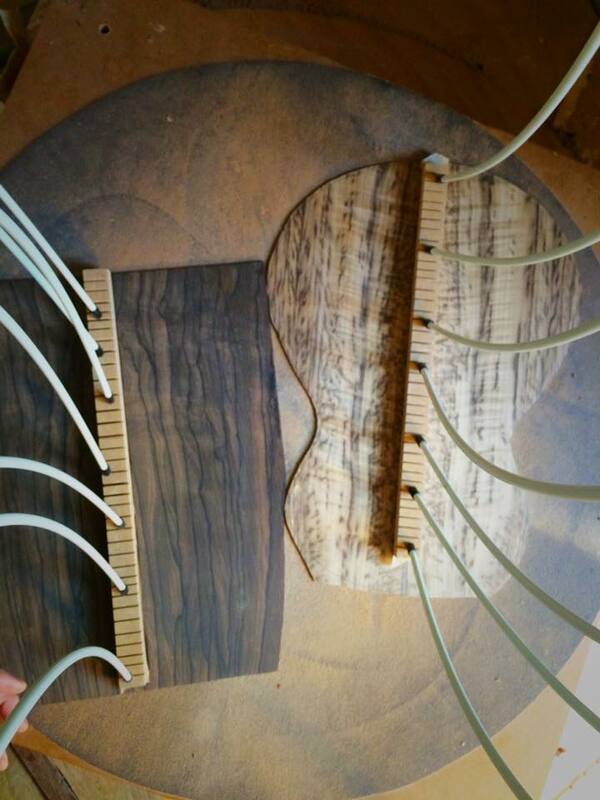 This is assuming the luthier does sensible things, such as strengthen/stiffen the sides and brace the back accordingly, all which lead to a minimization of energy loss. If you have floppy sides and back, energy–sound, tone etc.–will be lost. In such a floppy case the wood’s tap tone does contribute to the sound (or lack of), such as on a flamenco guitar. 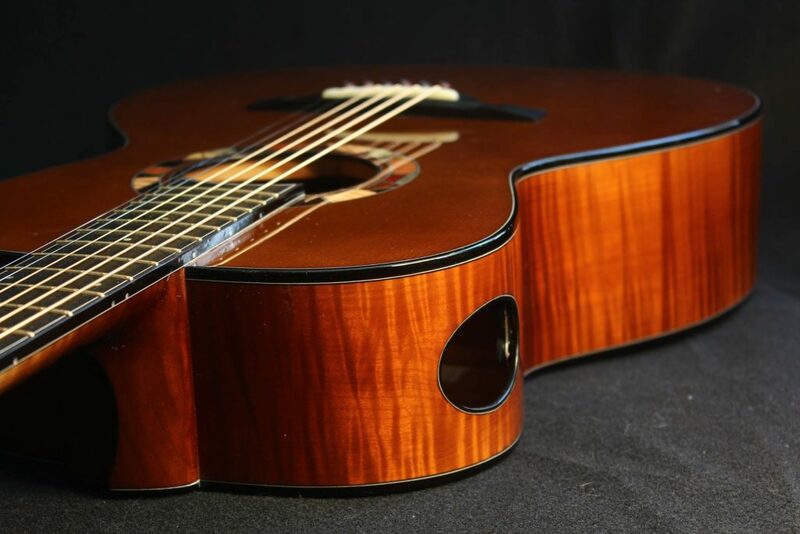 Spanish cypress tap tone is as lacking in “Q” as Tasmanian Tiger myrtle, but the fast attack and no sustain is desirable in a flamenco guitar and, to a lesser extent, a bluegrass picker, not, however, on a modern fingerstyle guitar guitar. So, in short, I just don’t think the back/sides do much for the tone. 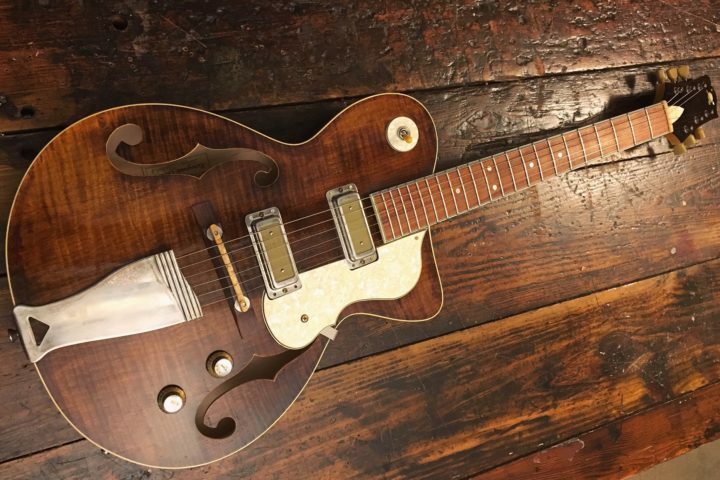 Having said that, and perhaps somewhat contradictory, I build with back/side woods that have an excellent tap tone, but that is simply a symptom of the fact that 95% of available “tonewoood” from LMI and others has a good tap tone. 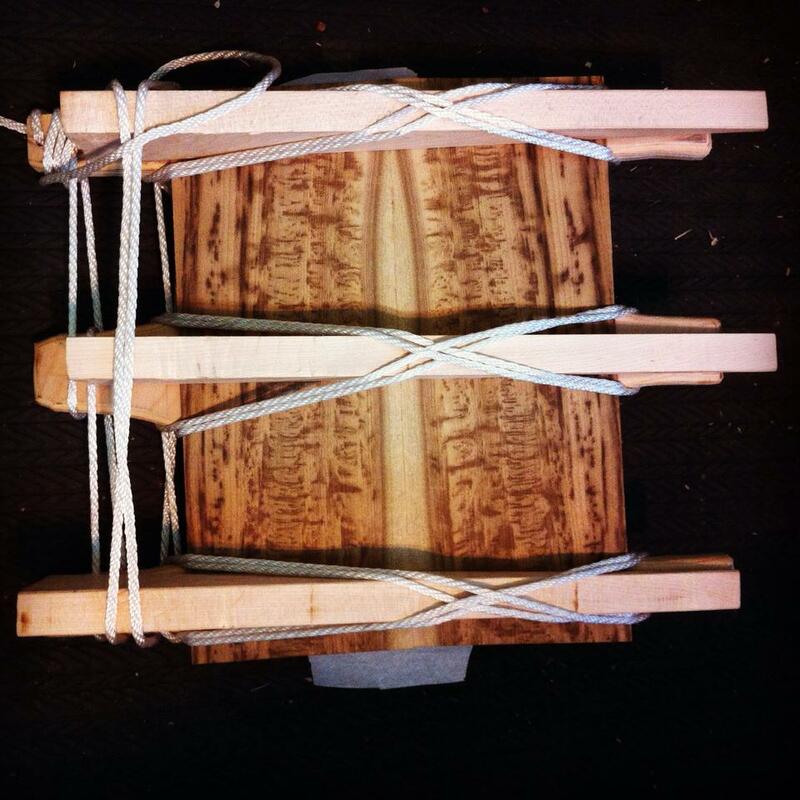 As for tops, I have four principles: stiff, light, minimal run out and quartersawn. I enjoy bringing out the medullary rays as much as possible, which is only possible on quartersawn wood with no runout. I’m personally not at all fussed on grain width as long as the wood has the first four properties. I do, however, reach for tighter grained tops due to the usual players education and knowledge of wood, which is “tight grain also equals it possessing the best quality of the first four principles.” That is somewhat akin to thinking a better looking person is a better moral person. There is a correlation between tighter grain and general quality–I agree with Dana Bourgeois’ 70%-ish estimate–but it is similar to the back and sides contributing in a large way to the sound myth. It has been over-emphasized. Like the Tasmanian Tiger myrtle insight, I had a similar one with a top. I used a top that was absolutely perfect, super stiff and perfect tight grain, but that darn top was too good! It was just too strong and I had to re-top that instrument as, even at 1.5mm thick, it was still super tight. So stiffness is relative to the instrument, not an exponential curve of greatness. 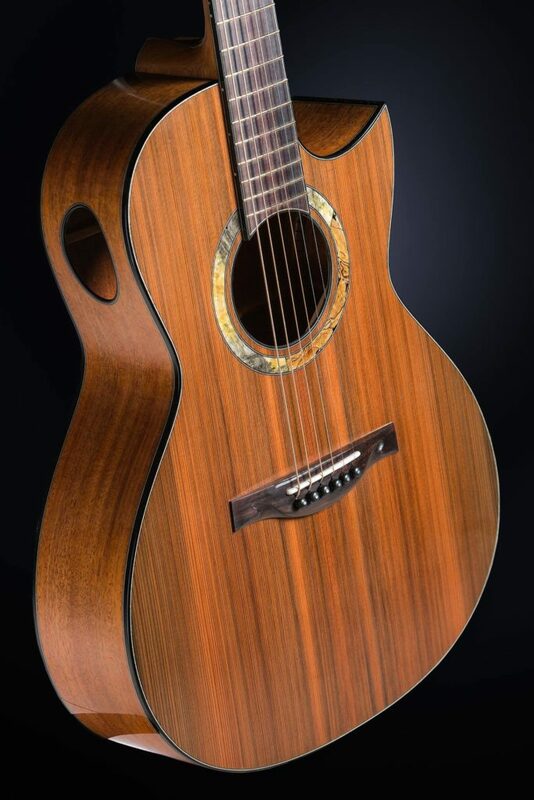 BH: The usual answer to this question is, “Oh yes: a 1935 Martin whose tone I’ve been chasing ever since.” I, however, just don’t think that way. The reason for that is because every instrument I see I learn something from, equally, it seems. This “learning” ranges from looking at inspiring or logical elements, be they engineering or aesthetic forms that I will incorporate into my own instruments, to horrible elements that didn’t work. 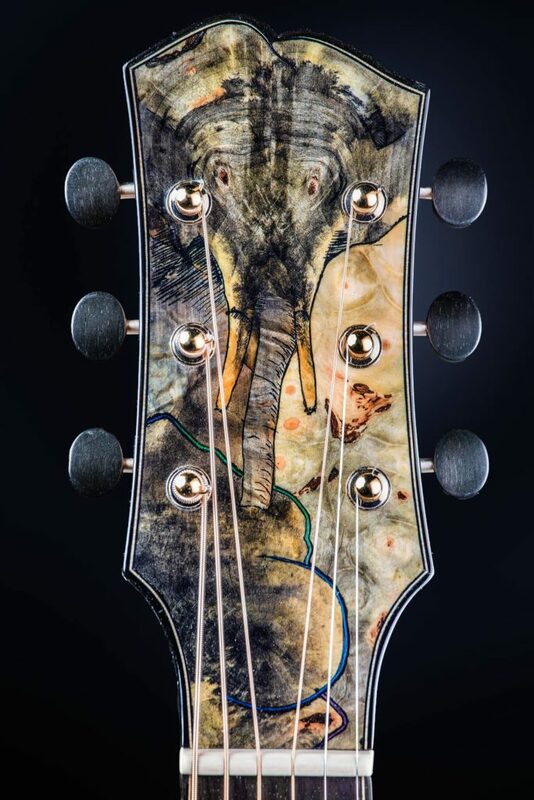 So no, there is no one favorite guitar that I’ve ever seen. My “favorite” could be a $150 beater or a $100,000 rare bird that I learn something from. 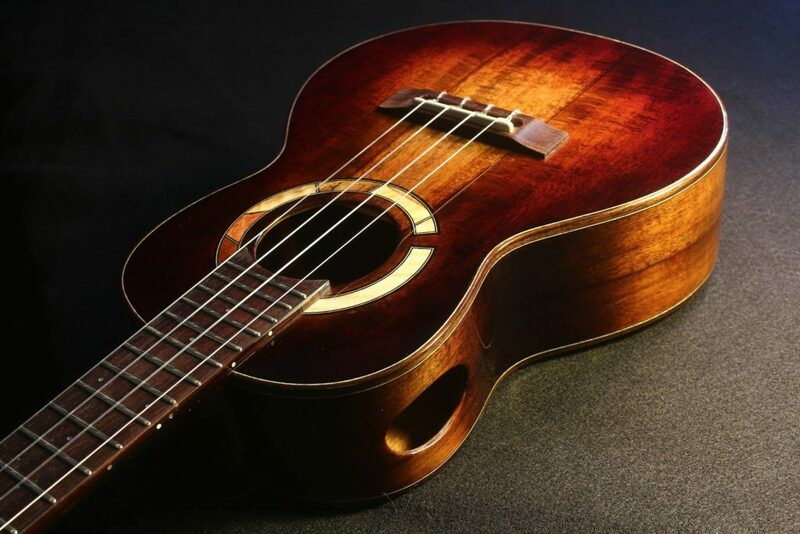 A charity tenor uke made from “The Tree” figured mahogany. 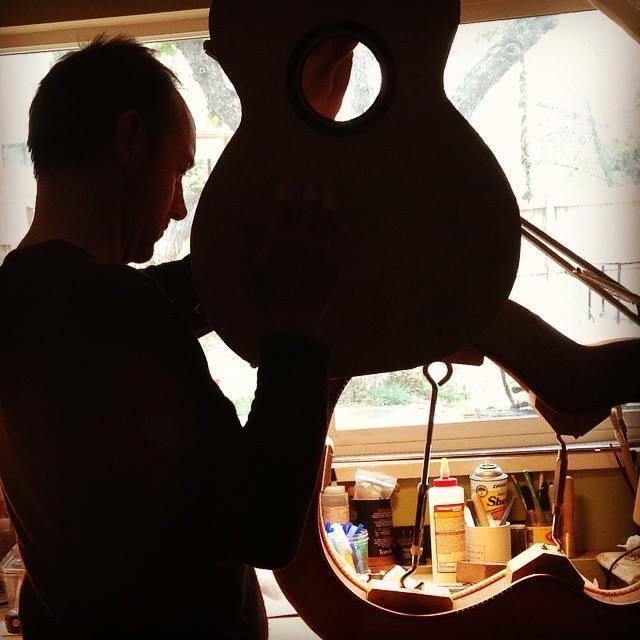 This project involves seven world class luthiers making seven “Tree” ukes in there own style. This all hasn’t been announced yet so I will say no more on that for now. I will also be making, in conjunction with Hawaii Music Supply (the best uke store in America), a handful of ukes in the same back/side/neck woods ,but with different top species–something like Sitka, Engelmann, Port Orford cedar, redwood, cedar, moon spruce, Adirondack and torrefied spruce. 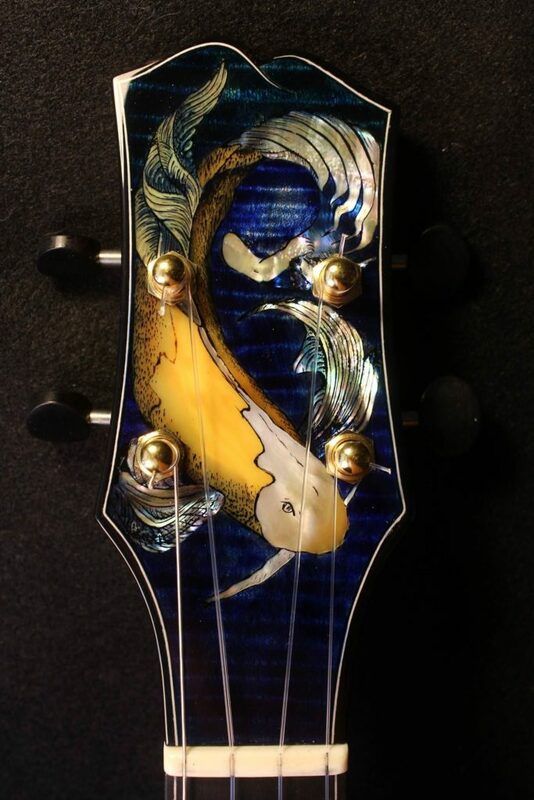 FJ: In addition to guitars, you build tenor guitars and ukuleles. What drew you to those instruments? BH: It started with ukes. While at Gilet Guitars a student came in and wanted to build a tenor uke in Tassy [Tasmanian] blackwood. It turned out great and I was delighted with it, so I began to look into ukuleles. This led me to looking into classical guitars (which we built at Gilet) due to both having fan bracing, the tops being a similar thickness, etc. As a high-end guitar maker, I was kinda sickened by the position the ukulele had in people’s minds. It wasn’t thought of as a “real” instrument or something real music can be played on, only a whimsical toy on which catchy jingles with a beachy theme can be strummed. Well, thankfully a strong few of us (compared to the number of guitarmakers) are making really nice high end ukes. 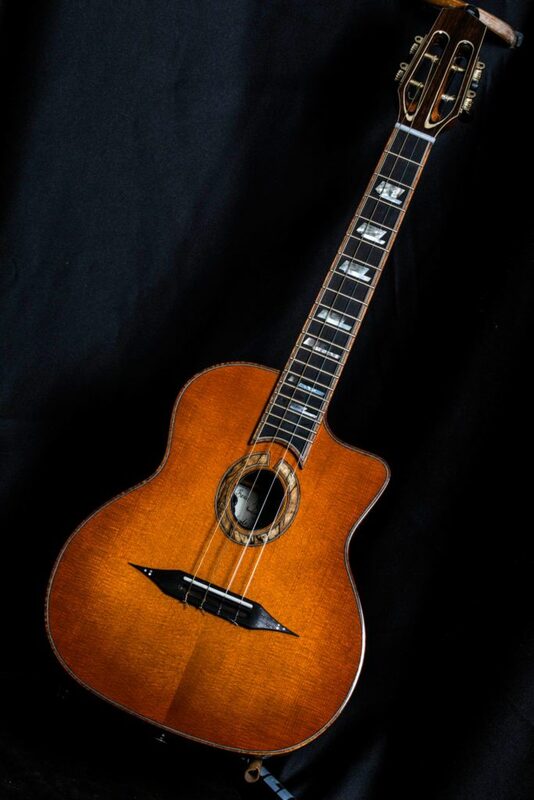 My goal for ukes is to think of them as a classical guitars, to make them sound as good as a great classical guitar. There is no reason not to think this way. As for tenor guitars, I made a uke for a fellow in Tasmanian blackwood with redwood top and he wanted a matching tenor guitar. So I designed a new shape and made a successful instrument. After 14 years of building, it is nice to make a new thing and nail it the first time. 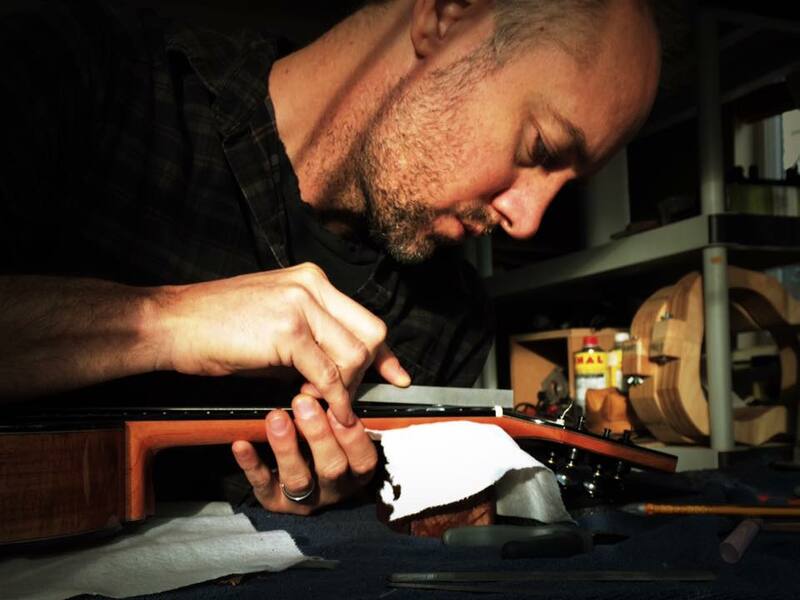 All instruments are “just” a vibrating surface and being a luthier is understanding how to get that surface to work optimally. BH: I have three things about me that make me unemployable in any real job and give me inspiration. First, I went to a Waldorf, Rudolf Steiner school for six years as a child. That’s where I started playing guitar, drawing, painting and thinking in an artistic way. Second, I have a degree in Fine Arts, majoring in oil painting and etching. Third, I have a degree in Theology and Philosophy. I really wasn’t joking about being unemployable! But it does allow me think creatively and execute those thoughts into wood and shell. I find inspiration in a lot of art books: Michelangelo, Raphael, Rembrandt, Da Vinci, Durer, Mucha, Vermeer, Picasso and the lesser known French Symbolist Gustave Moreau. I like different things in different artists: the strong light of Rembrandt and Vermeer, Michelangelo’s incredible sculpture, the colour of Cezanne, the balance of space and strong lines in Picasso, the etched lines and form of Durer and the incredible sense of serenity of Japanese prints and calligraphy. I could go on and on… and on.